On Nov 5th, Microsoft announced a new service named Windows Azure Scheduler, which allows us to invoke actions (such as calling HTTP/S endpoints or posting a message to a storage queue) on any schedule. Then on Dec 13th, Scott Guthrie published a blog post introduced this new feature. 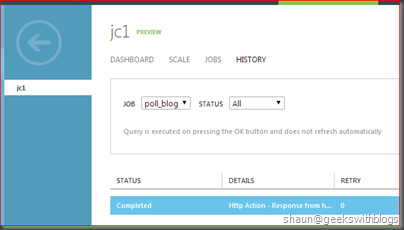 In this post Scott demonstrated how to use this feature to create a blog poll job each 5 minutes through the Windows Azure portal. At the end of his article he mentioned this feature can be used through .NET API package. I think using Windows Azure Scheduler from our code would be more frequently than from the portal, since normally we might need define, update, enable or disable jobs from our application or through our application instead of asking our end users to update jobs from azure portal directly. So in this post I would like to introduce how to use this feature from a .NET code. Currently Windows Azure Scheduler SDK is still in preview phase on NuGet. So if we search the package from Visual Studio Manage NuGet Packages dialog we will not be able to find it. Hence we must open the Package Manager Console window in Visual Studio and install it in command-line mode with the preview flag specified. Let's create a new console application and open the Package Manager Console then type of command as below. Do not forget the last "-Pre" argument. 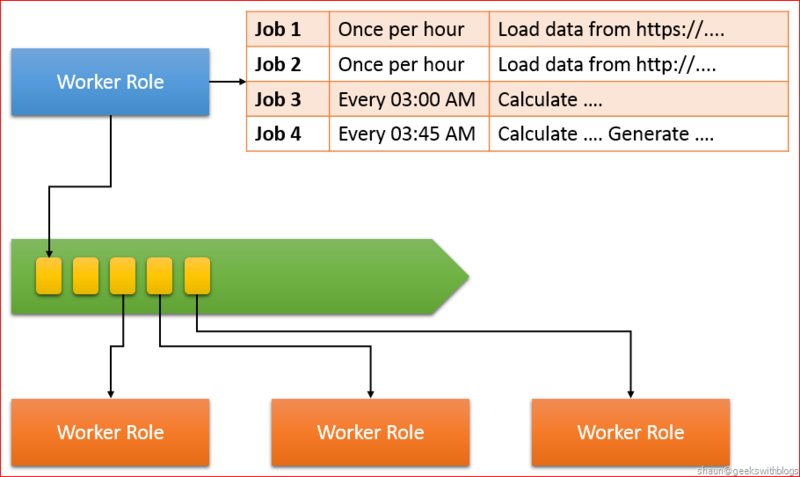 If you have read Scott's blog you should understand that in Windows Azure Scheduler each job will be defined in a job collection. But you might not know that each job collection should be located under a "Cloud Service". And more confused, this "Cloud Service" was totally a different entity than the "Cloud Service" we are familiar with which can be used to host web role, worker role and virtual machines. In this case the "Cloud Service" is a container for resources intended to be more utilized in future versions of the service management API. And there are some resource providers that implement this new internal API such as Windows Azure store, HDInsight and some others. Windows Azure Scheduler is another resource that will be located in this "Cloud Service" so before we created job collection and job, we must firstly create a new Cloud Service, define the region where our scheduler will be hosted. We will create a new cloud service through Windows Azure Scheduler SDK. First of all we need to populate a valid Windows Azure credentials with a management certificate configured properly. The code below retrieved the management certificate from local machine and initialized a certificate cloud credential instance by specifying its thumbprint. Please refer this document on how to create, upload a Windows Azure Management Certificate. And make sure you have install this certificate on your machine at Current User. Then I created a subscription credential from this certificate and its Windows Azure Subscription ID. Now we would be able to create a cloud service for our Windows Azure Scheduler from the management client. In the code below I created a new cloud service located at South Center US. Now we have a cloud service available, the next step is to create a job collection inside it. In the code below I initialized a new management client named "SchedulerManagementClient" which takes the responsible for managing the scheduler job collection as well as the resource provider. You might need to invoke "SchedulerManagementClient.RegisterResourceProvider" to register a new resource provider if you got the exception "The subscription is not entitled to use the resource" when you executed the code listed below. Ref the resource provider problem please refer to Sandrino Di Mattia's blog. Once we have "SchedulerManagementClient" ready we can create a new job collection with the plan and quota specified. Since I used "Free" plan so the quote must be smaller than once per hour, and assigned to the cloud service I had just created. Finally I will create a new job in this job collection. To manage jobs I need to initialize "SchedulerClient" which can be used to create, update and delete jobs inside a job collection. In this example I defined this job with a HTTP polling action to this blog website once an hour, with the job named "poll_blog". You might notice that I invoked "SchedulerClient.Jobs.CreateOrUpdate" instead of "SchedulerClient.Jobs.Create". This because "CreateOrUpdate" will trigger an HTTP PUT request to Windows Azure Management RESTful API with job name provided, while "Create" will trigger an HTTP POST request that job name will be generated by Windows Azure automatically. So if you utilized "SchedulerClient.Jobs.Create" you will find the job name would be an GUID. Now we have finished all codes to create a cloud service, job collection and job from the .NET SDK. The full code listed below. Now let's execute this application. This will invoke Windows Azure Management API to create the job collection and job. 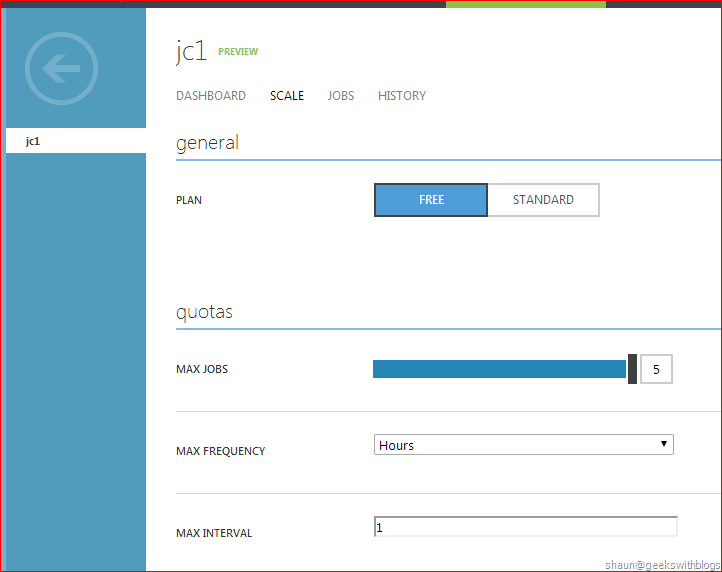 Then we can back to Windows Azure portal to see a new job collection had been created at the region we defined. Click into this job collection we will find the plan and quota is the same as what we wanted. And the job we created from our application will be shown in "Jobs" tab with the name we specified. And we will find that this job had been executed at least once after we submitted from the "History" tab. If we back to the "Dashboard" tab of this job collection, we will find the URI display at the right side of the page. The cloud service was shown inside the URI as below. Besides the job creation, we can retrieve the job execution history through this SDK. The history will be displayed in the command window. Which the same what we saw in Windows Azure portal. We can also retrieve the job collections from a given cloud service, jobs from a given job collection. And we can update, delete job collections and jobs as well. When define a job, we could be able define the retry policy and error action of the job executed failed. This two parameter can only be specified through .NET SDK. Windows Azure Scheduler allows us to define a time-based jobs in Windows Azure platform. We can use this feature to invoke a website or web service through HTTP request regularly. 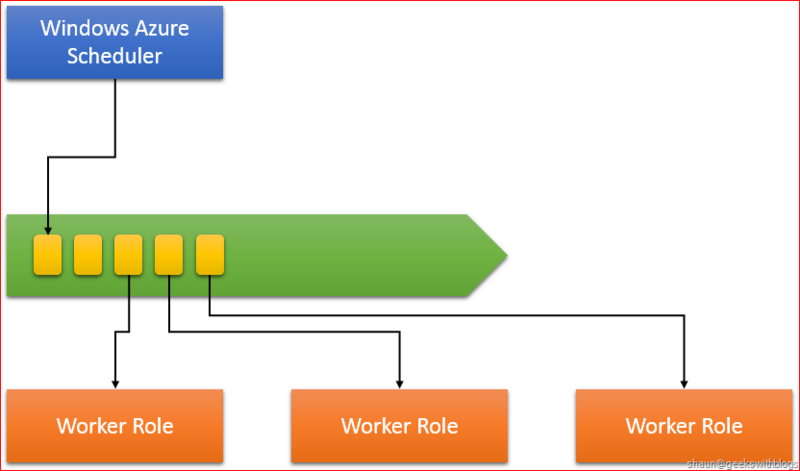 We can also let the job insert message into a Windows Azure Storage Queue so that some background worker roles can be trigger to start some backend processes, and this might be more useful in our application design and development. For example in one of my project there will be some backend jobs which retrieve some data from some web services and insert into Windows Azure SQL Database, and some other jobs will be started hourly or monthly to process those data. 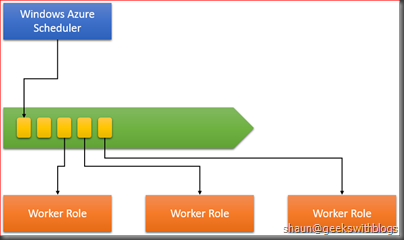 In my original deign, all jobs will be stored in Windows Azure Table and I utilized a dedicate worker role to check if it's time to start a job, generate a message into a queue then a related worker role will handle this message and start process the job. In this mode I need to implement how to store jobs (action and recurrence settings) into Table, how to go though the table and calculate when a job should be started. I also had to deal with concurrency if more than one worker roles to check the jobs. Now by using the Windows Azure Scheduler I can simplify my design as below. Those stuff such as how to store the jobs definition, how to start a job cloud be leave to Windows Azure Scheduler. What I need to do is to implement the relevant business logic for each job. Assume we have a class named "Person" as below. The constructor accepts two parameters for the person's first name and last name. We also added a method named "say", which accepts one parameter then return a string with the person's full name and the parameter value. I also override the "toString" method so that it will return "[object Person]". Then I initialized this class and invoke "say" as below. Let's execute it and as you can see the function was invoked without any problems. Now let's do something different. As you should know we can pass a function as a variant, just like string, number and Boolean, etc. So I will retrieve "say" function by its name (which is "say") and set into a local variant, then invoke this variant. The executing result was unexpected. Even I retrieved this function from the instance of my class "Person", when invoked you will find "_firstName" and "_lastName" were all undefined, and "this" was not my "Person" instance, instead it's "[object global]". But when we linked this function to a local variant, the context of the original function was lost. So that when we invoked this variant, current environment, which is [object global] will be the context. But there is no "_firstName" and "_lastName" in this context. This is the reason why the function returned incorrect result. We can added "_firstName" and "_lastName" as the local variants and executed this function again and we will found it worked but was not used the name defined inside our class. We assigned the value to the variants "_firstName" and "_lastName" without defined so that they will became members under the global context. The code only worked under the non-strict mode. Let's change our code to invoke "say" through "call" and "apply". Then execute our application we will see the function was invoked under our instance even though from the local variant. With "bind()" method, we can set the context of a function. So in the future we can invoke this function variant without specifying the context when invoked. In the code below I retrieved the function from its key ("say") and invoked the "bind" method to set "shaunxu" object as its context. Then invoke this function variant directly. And we can see it returned correctly. By using "bind" we can set any object as the context of a function. This gives us extremely flexibility to extend our code. In the sample code below I bind my function to a new object with "_firstName" and "_lastName" members and it worked as we expected. We must understand once we assign a function into a variant the context of this function will be changed. It will be the calling function if our code was in a function, or global of it's in top level. When invoke this function variant we should specify correct context through "call" and "apply" method. Alternatively we should set the certain context through "bind".